Click here to reveal your exclusive loyalty perks. Full of character on the outside, with every contemporary comfort on the inside, The Barbican Rooms cleverly combine the privacy and peace of a private apartment with the five-star facilities of the Montcalm at the Brewery just across the street. Moments from both the culture of the Barbican Centre and the heart of corporate London, this row of quintessential Georgian townhouses offers a smart sanctuary for time-pressed travellers, on a quiet yet central City of London street. The Deluxe single rooms are beautifully designed, featuring contemporary heritage style interiors. Rooms come complete with features including comfortable a single bed, LCD TV, a minibar, iPod docking stations, complimentary Wireless and Broadband Internet access, en-suite bathrooms with rain showers and Elemis toiletries. The Deluxe Double Room are beautifully designed with a touch of luxury and furnished with a breathtaking range of facilities to make your stay comfortable. These rooms are beautifully appointed and perfectly equipped for the ultimate hotel experience. Additional amenities include complimentary broadband and 40 flat screen LCD TV's. The Montcalm City Club Studio with Kitchenette offers a sense of space, style and sophistication. Each of our luxurious suites is individually designed with sumptuous fabrics and state of the art technology. Additional amenities include complimentary broadband and 40"flat screen LCD TV's and complimentary lounge access. The bedroom features a deluxe en-suite marble lined bathroom with Gessi rain showers, bathtub and world class toiletries. The Deluxe Triple Room are beautifully designed with a touch of luxury and furnished with a breathtaking range of facilities to make your stay comfortable. These rooms are beautifully appointed and perfectly equipped for the ultimate hotel experience. Additional amenities include complimentary broadband and 40 flat screen LCD TV's. 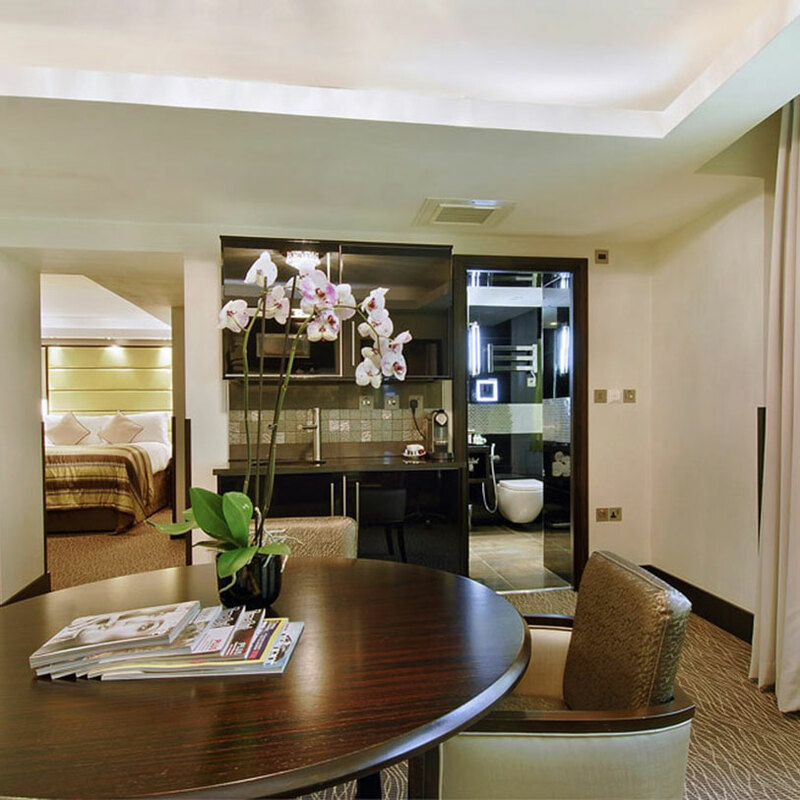 The London City Suite offers a sense of space, style and sophistication. Each of our luxurious suites is individually designed with sumptuous fabrics and state of the art technology. Additional amenities include complimentary broadband and 40" flat screen LCD TV's and butler service with complimentary lounge access. The bedroom features a deluxe en-suite marble lined bathroom with Gessi rain showers, bathtub and world class toiletries. * Please note that the check-in time is 2:00pm and check-out time is 12:00 noon. St Paul's Cathedral is one of London's most impressive landmarks. Built in the 17th century, this Anglican cathedral emerges is the tallest building in the City of London and the fifth cathedral built there since 604 A.D. The Tower of London is an ancient fortification overlooking the River Thames, which was used as a castle, a palace for The Royal Family and a prison. Nowadays it is owned by an autonomous charity. Tower Bridge is an emblematic architectural monument offering stunning views of the Thames River from the top. It is in the vicinity of the Tower of London, where its name comes from. At 202 ft (651 metres), The Monument is tall column from the Roman period made of stone at the intersection of Monument Street and Fish Street Hill, area where the Great Fire of London took place in 1666. Shakespeare's Globe Theatre, the former Globe Theatre, is over 750 ft (230 metre) away from the initial theatre built in 1599 and burnt in 1613. The new theatre is an Elizabethan show hall opened since 1997. It has approximately 300 stores, 70 food and beverage outlets and is the biggest shopping mall in Europe. It takes 20 minutes to arrive to this famous shopping paradise by tube. Stores that are worth a visit include Selfridges, House of Fraser and the vintage shops of Carnaby Street. It is currently one of the newest areas for shopping lovers. Featuring cafeterias, restaurants with prestigious chefs and fashionable men's and women's clothing, it is overlooking the renowned St Paul's cathedral. The East End is the perfect area for those people that love vintage, flea markets and trendy designer stores. Whether it is food, clothes or accessories, you will find anything you need. The Whitechapel is the ideal place to see an exhibition of contemporary artists as well as shows of local interest. Located near Aldgate tube station, It is considered to be one of the most consolidated art galleries in London. The Tate Modern is the most famous international modern art museum in the UK, located at the former Bankside Power station. It is the most consolidated museum of contemporary art and is only 2 miles away from our property. It is the biggest art centre and conference facility in Europe, located in the heart of the City, where all types of performances take place. It is also the home of the London Symphony Orchestra and the BBC Symphony Orchestra. At The Museum of London the history of the UK's capital and its people is explained. It features a collection of more than 2 million objects and is visited by approximately 400.000 visitors each year. In addition one can enjoy the biggest archaeological archive in Europe. The Design Museum was allegedly the first modern design museum. Dating from 1989, it is within close proximity to Tower Bridge and overlooking the Thames River. Being a vegetable market in the past, it is currently a bohemian, lively and fashionable area. Sunday is the best day of the week to visit it, as one can try organic food and purchase trendy clothes and exclusive jewellery. Borough Market must be visited by food enthusiasts. Featuring numerous stalls of organic food and plenty of cafeterias around the medieval market, you will definitely enjoy tasting all the fresh products offered. This market is entertaining. Columbia Road is a flower haven in modern East London featuring around 50 stalls with flowers for sale, plants and garden decoration accessories, together with thick coffee. Leadenhall Market is an indoor market to discover on Gracechurch Street. The market has existed since the 14th century and one can basically purchase fresh food. Cheesemongers, butchers and florists are its main vendors. There are also some clothing stores.